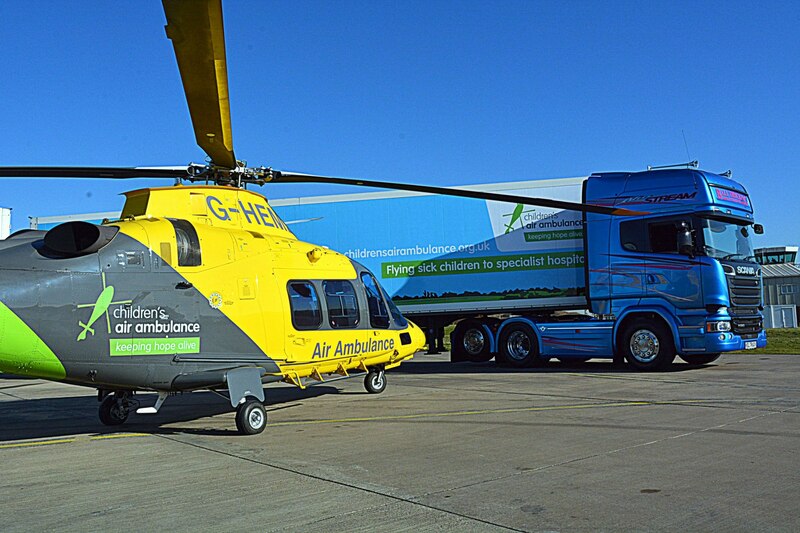 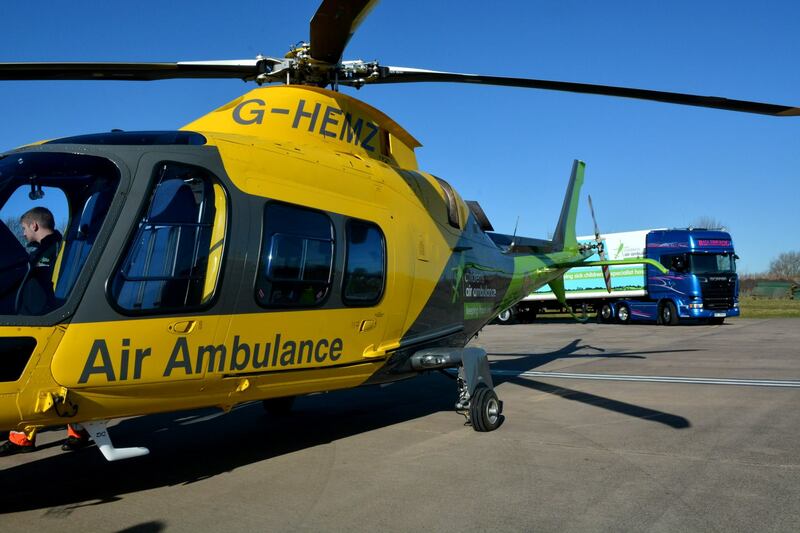 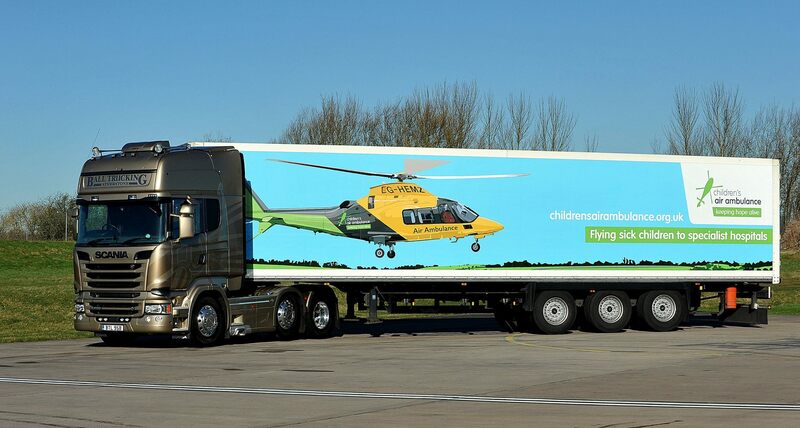 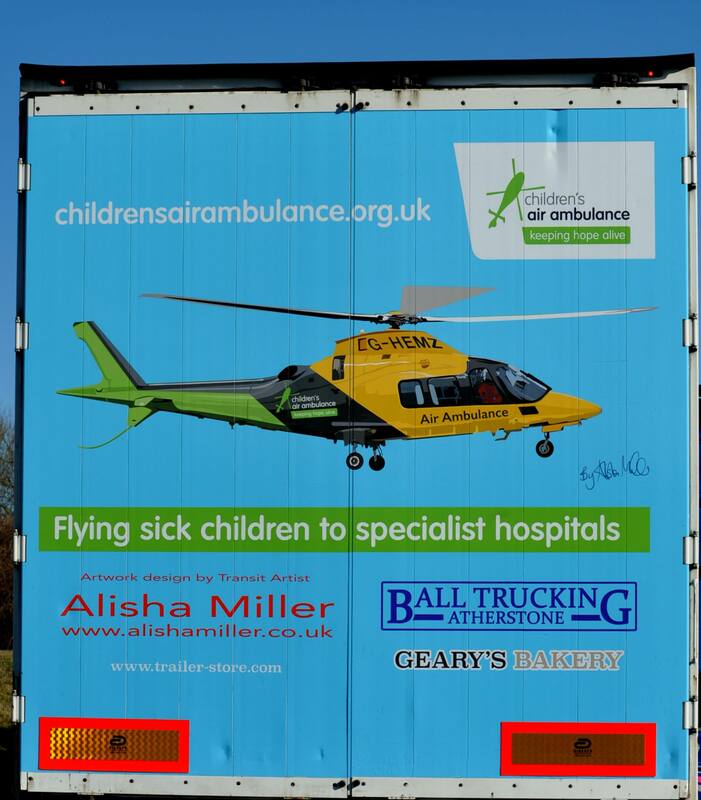 Transit artist Alisha Miller and haulier Alan Ball have teamed up to help support the fantastic charity Children’s Air Ambulance. 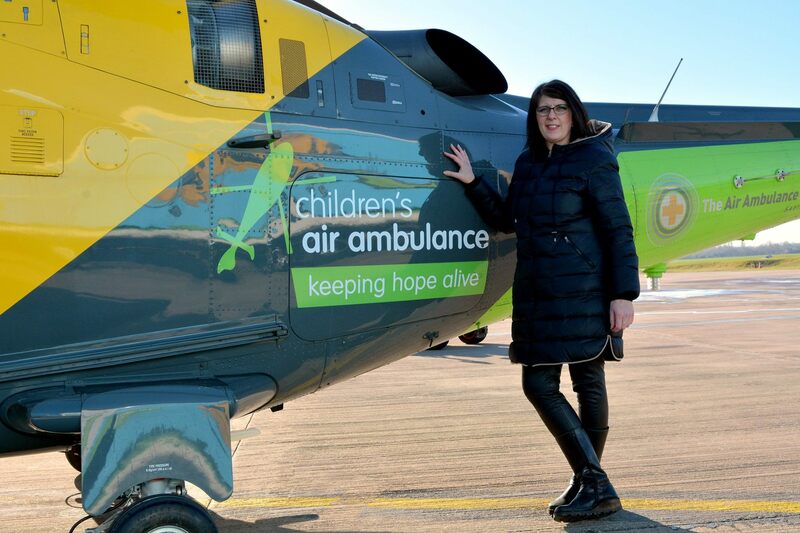 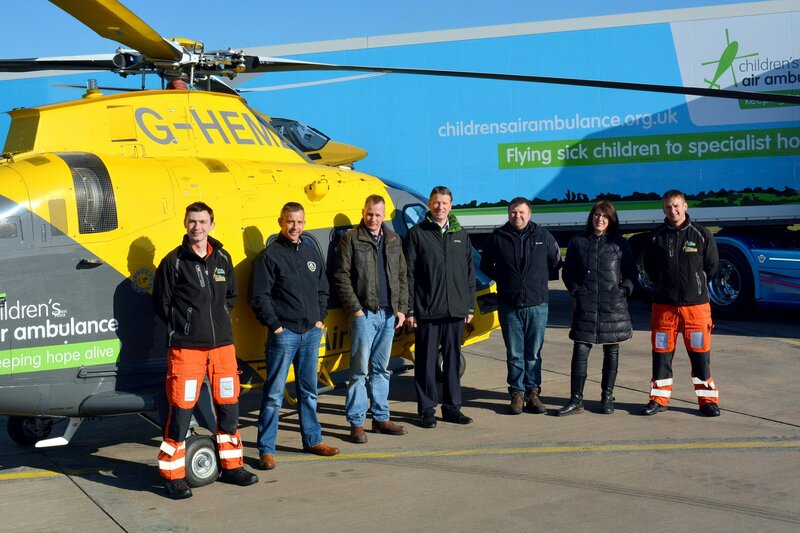 Working closely with the Children’s Air Ambulance (CAA) team and chief fundraiser Tracy Grunwell, Alisha and Alan have donated their expertise, time and money to create this fantastic artwork to help advertise this most special and worthy cause. 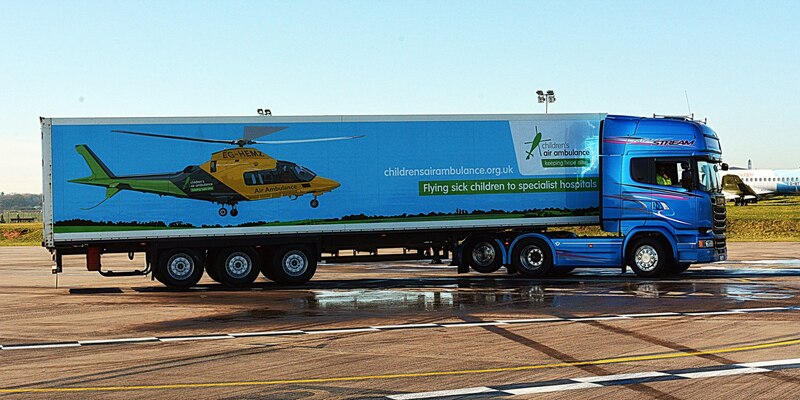 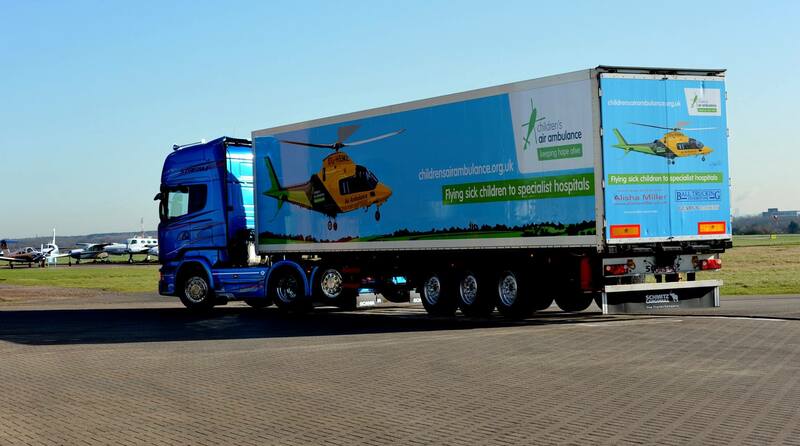 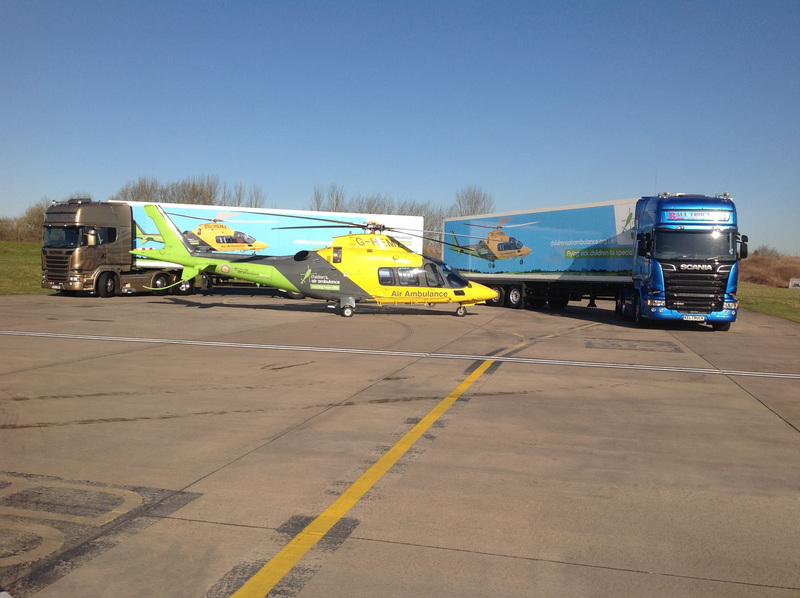 The artwork has been created to help raise awareness for CAA, the lorries are featured here with the CAA helicopter and two very special Scania cabs, supplied by Keltruck in West Bromwich which will transport the artvert (artwork/advert) across the country, to Scotland and back. 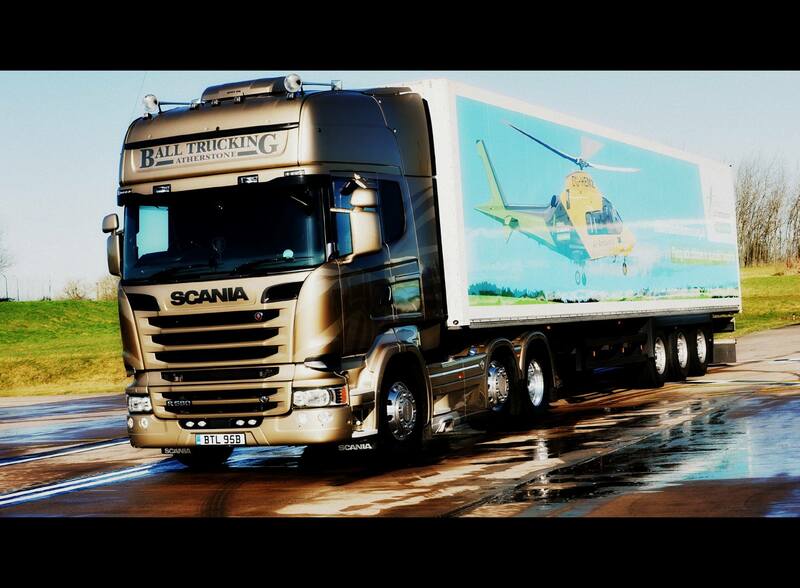 The Golden Griffin was designed to celebrate 50 years of Scania in the UK. 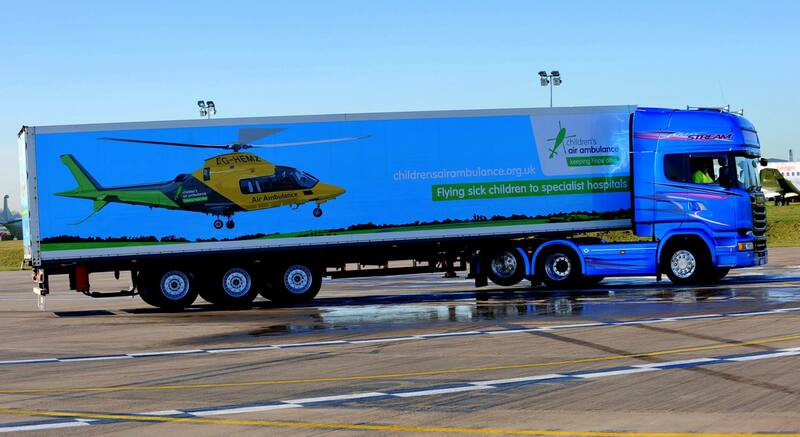 It is number 7 of only 50 special editions made in 2014. 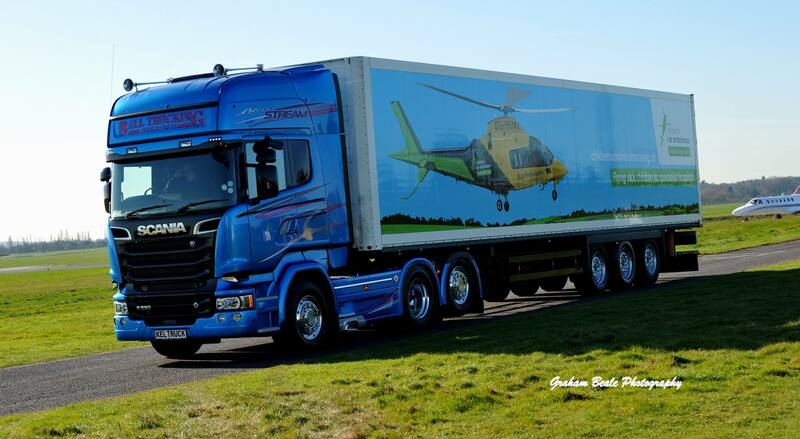 The blue cab – a Scania V8 called the BlueStream – is number 90 of only 100 made with this photo shoot being its maiden voyage. 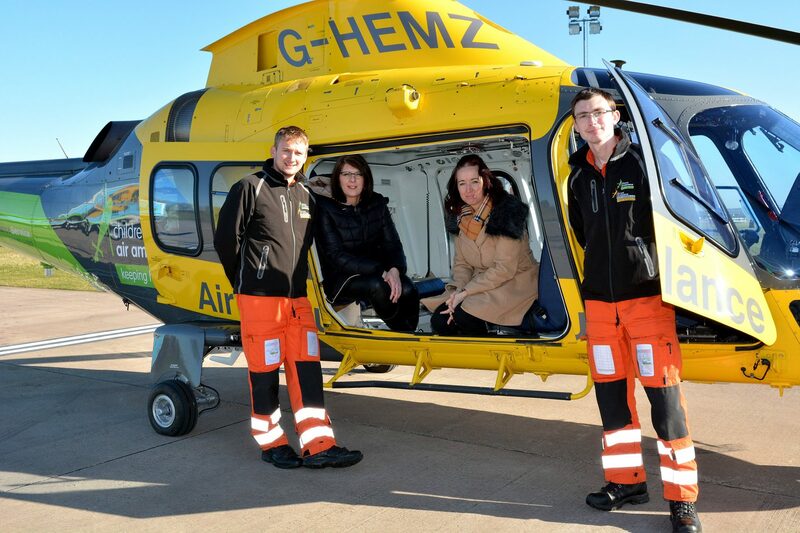 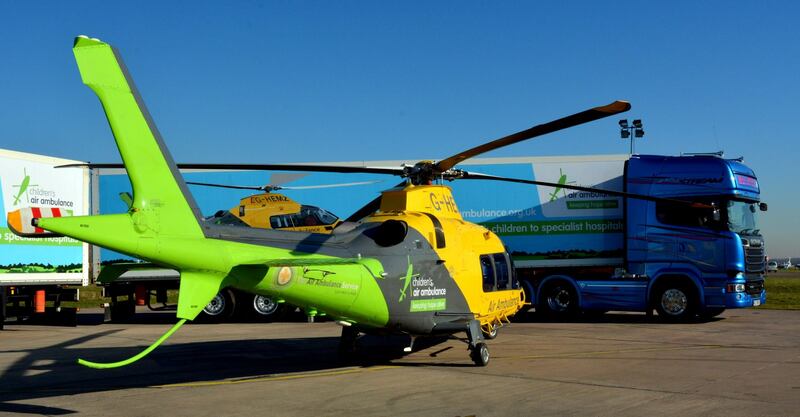 The photos were taken by professional photographer Graham Beale, who is also supporting the CAA charity by creating limited edition photographs to be sold to help raise further funds for the charity. 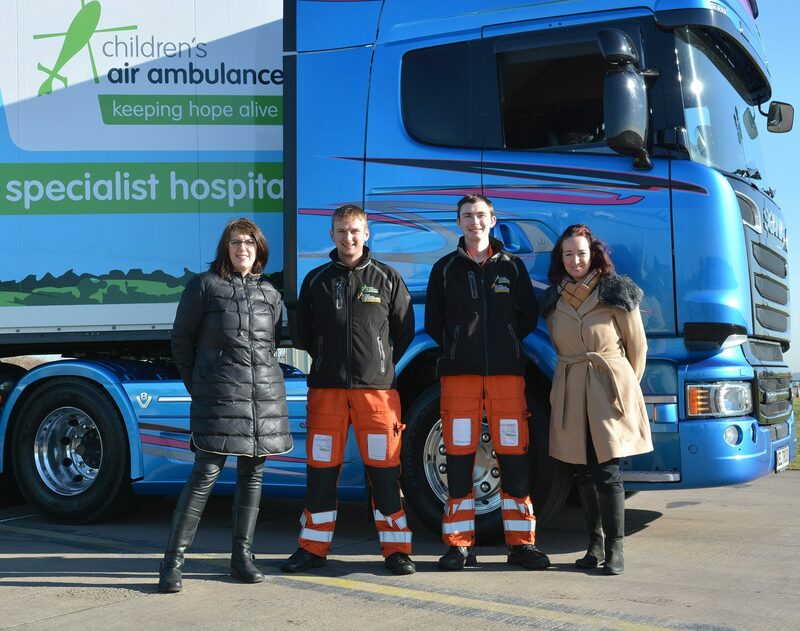 Pictured here are the two pilots Fionnan Collins and Alistair Bull, (orange trousers), Russ Kelly (Keltruck Scania), Alan Ball and Alisha Miller. 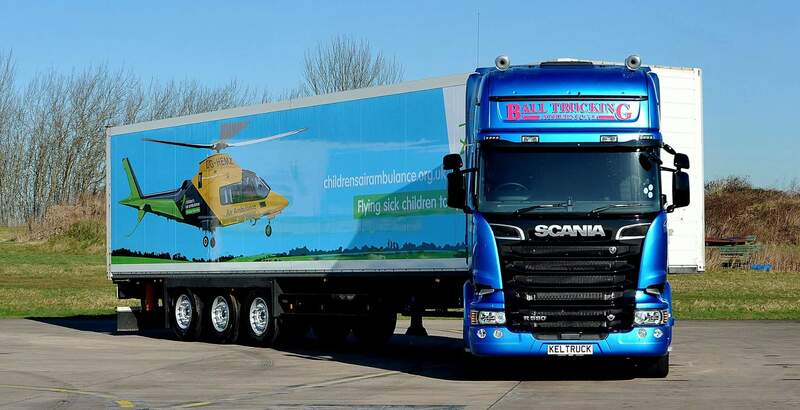 The Scania tractor units (cabs) and the two trailers are owned by Ball Trucking, Atherstone, Warwickshire and are the only two lorry trailers to feature the new artvert designed by transit artist Alisha Miller. 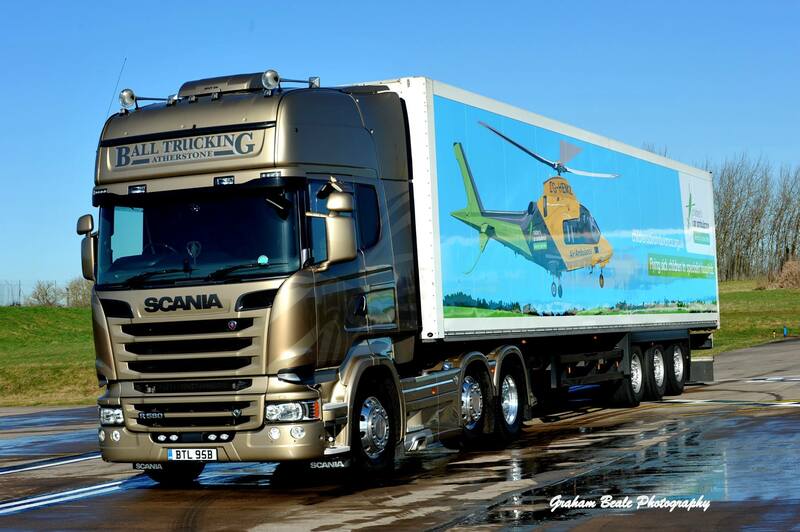 The two vehicles pictured are the Scania BlueStream and Scania Golden Griffin which are both limited edition 580 brake horse powered tractor units with high equipment levels including the Scania Prestige Pack, Scania Driver Pack and lighting pack. 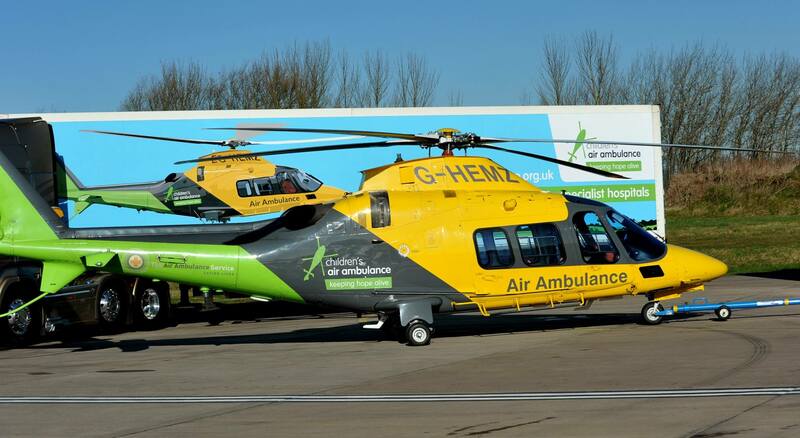 The vehicles have black leather interiors for added comfort levels. 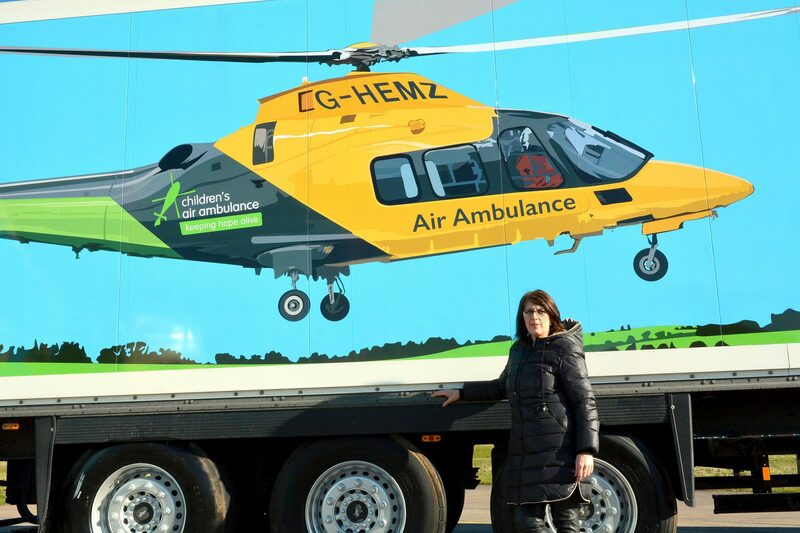 Artist Alisha creates enormous artworks for the sides of articulated lorry trailers. 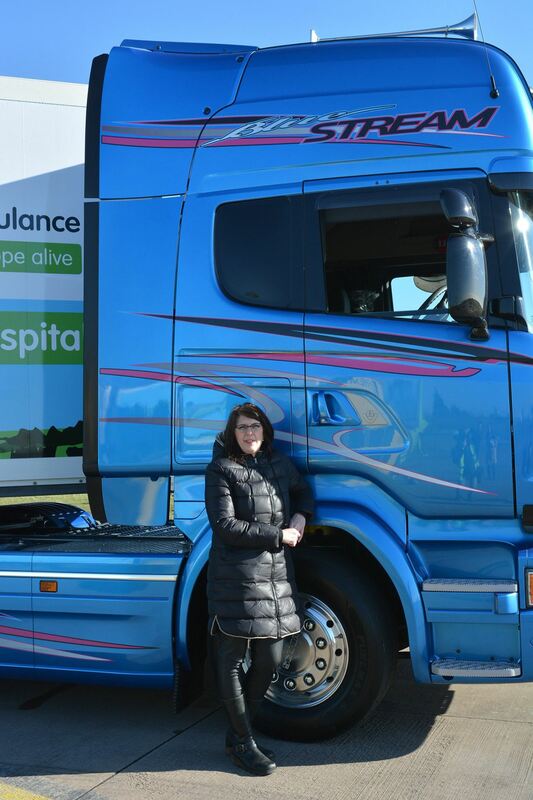 She first met Alan some years ago when Alan featured in one of Alisha’s artworks called Truckers Pin Ups, where the artist created large scale reflective vinyl line portraits of truck drivers and the landscape for her project Transit Art 2, her second artwork work to feature on lorries after securing funding from the Arts Council of England and Keltruck Scania. 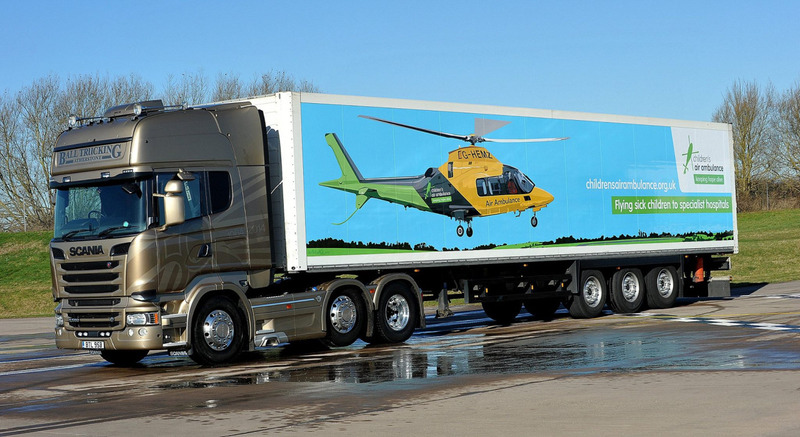 The artworks traveled the country on the curtain sides of a Rowntree Haulage articulated lorry for over a decade and was even featured on Channel 5’s Big Art Challenge. 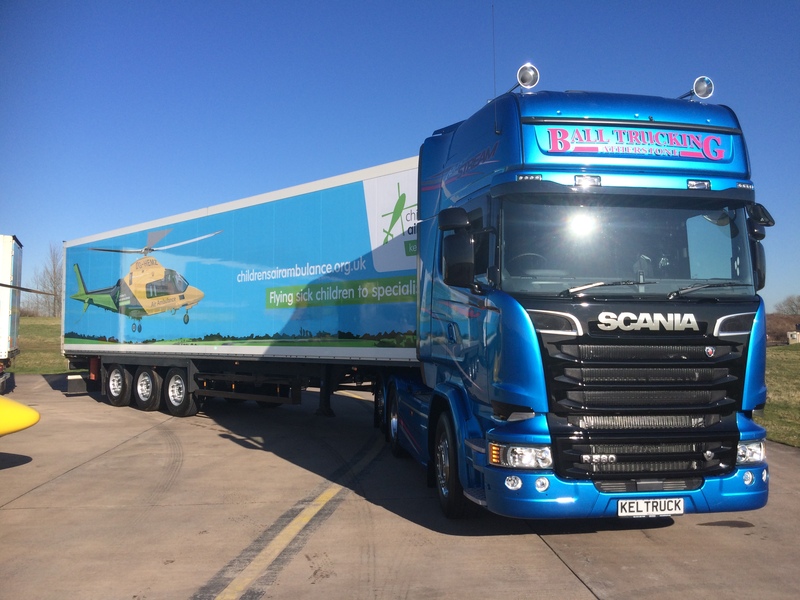 During this time Alan Ball has established his own successful haulage firm called Ball Trucking based in Atherstone. 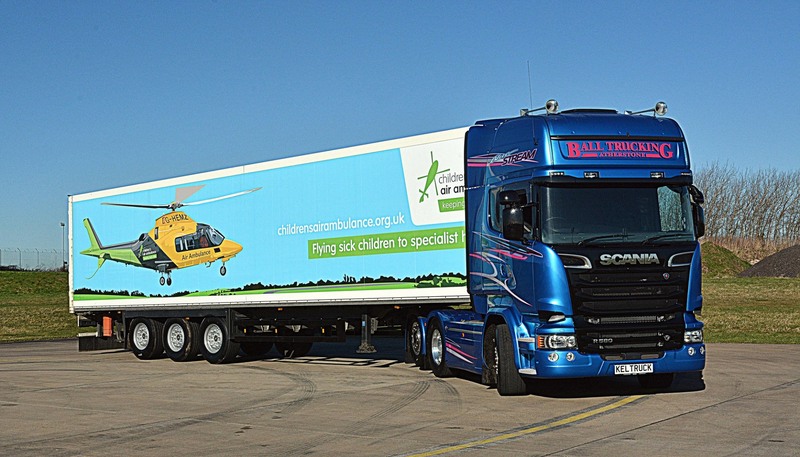 Alan and Alisha then met again by chance in 2015. 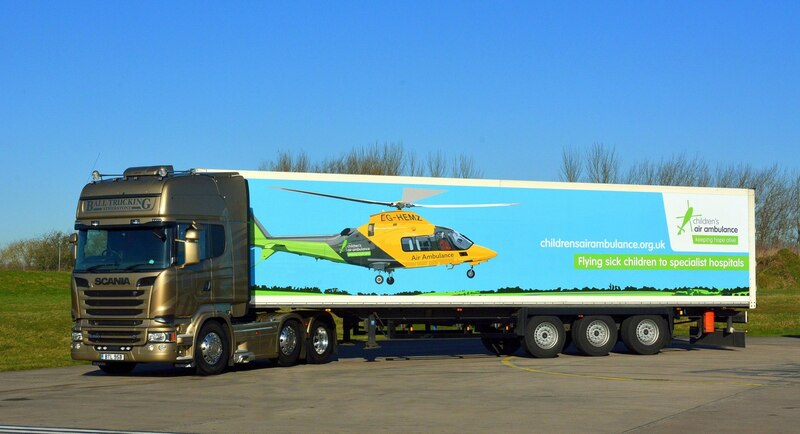 Alisha brought Alan up-to-date with all the lorries, buses, dustbin lorries and most recently the 10 landscapes she created for FreshLinc lorries in Lincolnshire, commissioned by Transported. 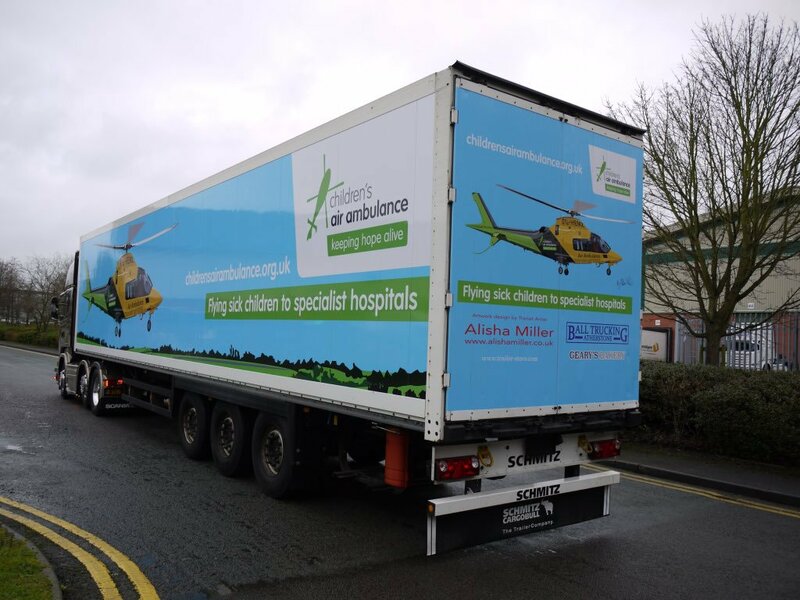 Alan was negotiating supplying a trailer to CAA to advertise their charity and immediately suggested that Alisha ring them and offer her artistic expertise. 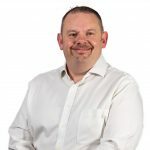 Click here for Graham Beale’s photo album of the shoot.